Caption slip reads: "Photographer: Lapp. Date: 1951-10-01. Reporter: Baker. Assignment: Billy Graham and Sawdust Trail. 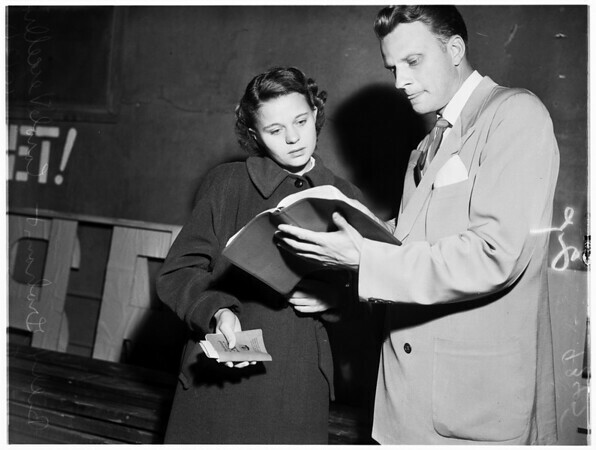 1: Counsellor Ray Zimmerman explains salvation to convert Charles Nehs. 2 & 3: R to Left: Note -- Billy Graham and convert Carole Veccellio. 37: R to left: Rev. Grady Wilson and Tod Green. 42: Rev. Grady Wilson talking to converts who hit the Sawdust trail. 33, 24, 45: Advisor Mrs. Dawson Trotman, left, with Mrs. Lovena McGlothin. 48: Converts coming 'the sawdust trail'. 41: Group praying. 29: Advisor on right talking to convert (no name)".